Giraffes are the tallest land animals which are found in Africa, south of the Sahara Desert and their primary source of food is the acacia leaves. They are well known for their long necks, long legs, and spotted patterns. They are tall from birth, the calves (baby giraffes) are 6 feet tall. You will find giraffes in savannas and grasslands. Unfortunately giraffes are often preyed upon by lions and their babies are often preyed upon by hyenas, leopards and wild dogs. When teaching your children about giraffes, it is always better to include fun crafts or other activities. 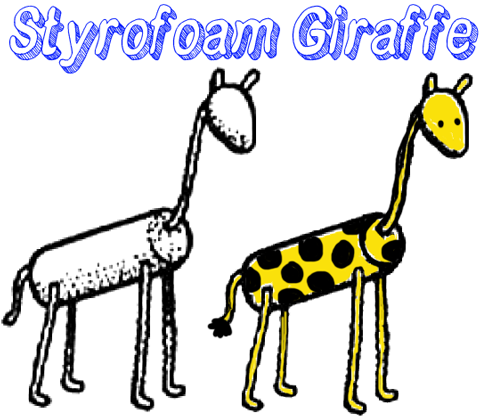 Children can make a keepsake giraffe from your child's hand print, construction paper and paint in yellow and brown. 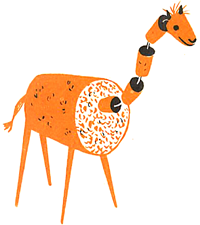 Another idea is making a giraffe from clothes pins (for the neck and legs), cardboard (for the body and face), paper, orange paint, black marker (eyes) and glue. (Make Sure Kids Aren't Allergic to Peanuts) The giraffe is a nice addition to your animal collection. You can make it easily from peanuts in shells, held together with toothpicks. Ears and tail are pieces of paper fastened with tape. Who says that corks can't be fun? 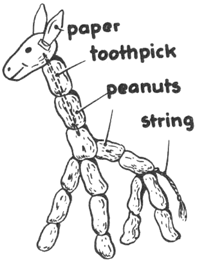 With some cork, thin wire, bits of yarn, toothpicks, and other supplies, youc an make a really cute giraffe creature. It is easy too. Look at the picture above. The corks are held together by thin wire. Use a bigger cork for the body...and smaller corks for the neck...if you don't have different sized corks, just use one for the body and for the neck, you don't need to use any corks at all....just the wire. You could use something else for the face, such as a marker cap. The legs are made up of toothpicks. The tail and hair is made from yarn. The ears are made from felt. Remember, you don't have to use the same design as the picture, you can use different crafts supplies. First, print out either a black and white giraffe diagram or a color giraffe diagram. Then cut out the Giraffe Body. If you printed it out in black and white, you can color it with crayons, colored pencils, or markers. Then fold neck of giraffe accordion style (forwards and backwards a few times) so there will be six 3/8" folds. Use yarn for tail. Fasten clothespins to body to make legs (sketch b). 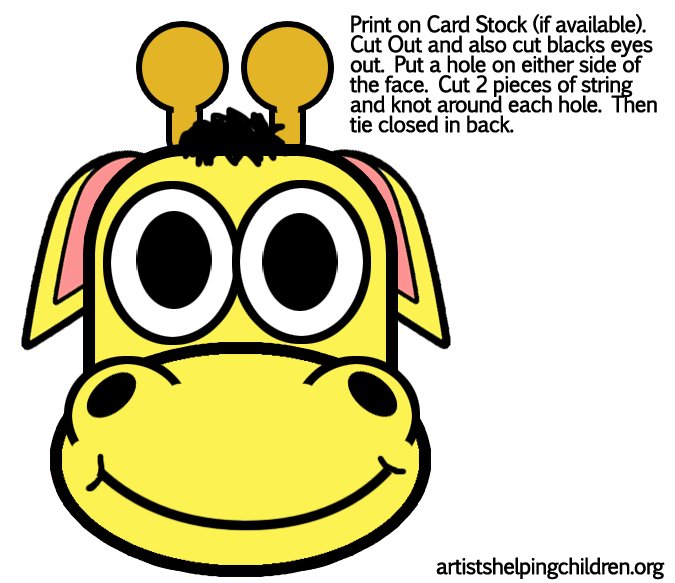 To make this paper giraffe mask, just print out the following giraffe mask template and then follow the directions included. To make these adorable giraffes, you are going to need some pipe cleaners (aka chenille stems). Look at the diagrams above to help you figure out which ways to twist and bend them. Bend one of the pipe cleaners for the giraffe's head. Then cut one more in two for the giraffe's legs and bend a small piece for the giraffe's ears. Wind another pipe cleaner around the giraffe's body to finish it off. You can be creative and follow your own ways of making these giraffes. Enjoy. Make these adorable giraffes with little effort, but tons of creativity. You will need a cylinder styrofoam piece, which you can pick up from a crafts store. Cut the cylinder in to 2 pieces...one long piece, and one short piece. The short piece will be the head...mold it into the shape of a head by molding it within your thumb and forefinger. Stick 2 small pieces of pipe cleaner into the top of the head. Use a black marker to draw 2 dots for eyes. Then connect the body to the head with a long yellow pipe cleaner. Cut 5 pipe cleaner pieces, 1 shorter than the others...this one will be the tail. The 4 others will be the legs of the giraffe. Bend them at the bottom so that the giraffe can stand. If you want to, paste a few small pieces of black yarn to the end of the tail. Pick a giraffe tutorial to try by picking one of the thumbnail images above. Wire Giraffes Craft - Made with Crepe Paper / Raffia and a Wire Hanger, this giraffe sculpture turns out great. Animal Placecards Crafts Ideas / Giraffe Placecards Crafts - Make these adorable giraffe placecards for a jungle party theme or for kids who love giraffes and zebras. 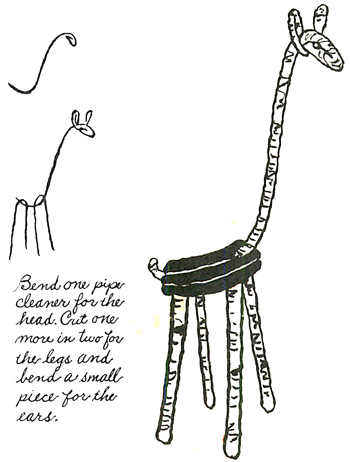 Clothes Pin Giraffe Crafts - Make a giraffe from clothes pins, cardboard, paper, orange paint, black marker, glue and a pair of scissors. Felted Giraffe Stuffed Animal Making Crafts Project - Follow these instructions to make this adorable giraffe stuffed animal. Folded Paper Giraffe - Learn how to make this adorable giraffe paper craft with the following instructions. Foam Marshmallow Giraffe Craft Idea for Kids - Make this cute giraffe from foam marshmallows. Giraffe Collage Crafts Activity for Preschoolers - This is a fun and easy giraffe collage for toddlers and preschoolers. 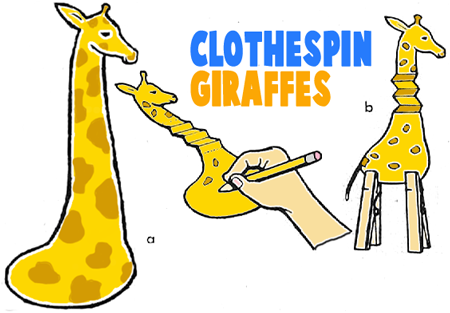 Giraffe Crafts Activity for Children - Children can make a simple giraffe craft using a paper towel roll, construction paper, giraffe template, glue, tape, scissors and a black crayon. Giraffe Handprint Painting Keepsake Craft for Preschoolers - Make a giraffe from your handprint, construction paper and poster paint in yellow and brown. Giraffe Pencil Holder for Dad - Make a Giraffe Pencil Holder for Dad to hold his pencils in. Giraffe Sock Puppet Activities for Children - Learn how to make a giraffe puppet from an old sock. Giraffe Toy Printable Paper Craft - Print the giraffe template and follow the instructions to put it together. How to Fold Origami Giraffe - Follow this picture tutorial to create a giraffe origami model. 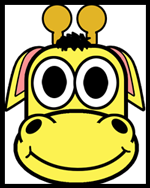 Jolly Giraffe Projects with Socks - Learn how to make a giraffe sock puppet using a few materials. Jungle Friends Crafts Project - Crayola.com shares with us a great jungle craft for children of all ages. 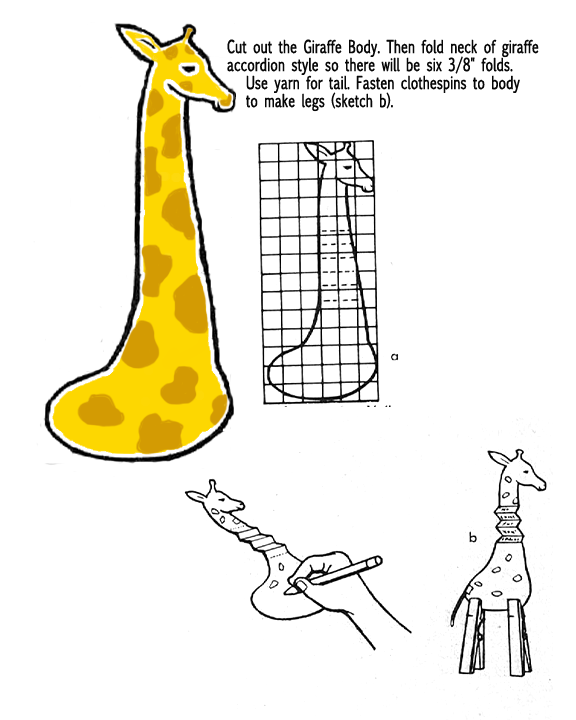 Lanky Giraffe Shadow Puppet Making Instructions - Create a giraffe using card stock, paper fasteners, yarn, flexible straws, hole punch, glue and scissors. 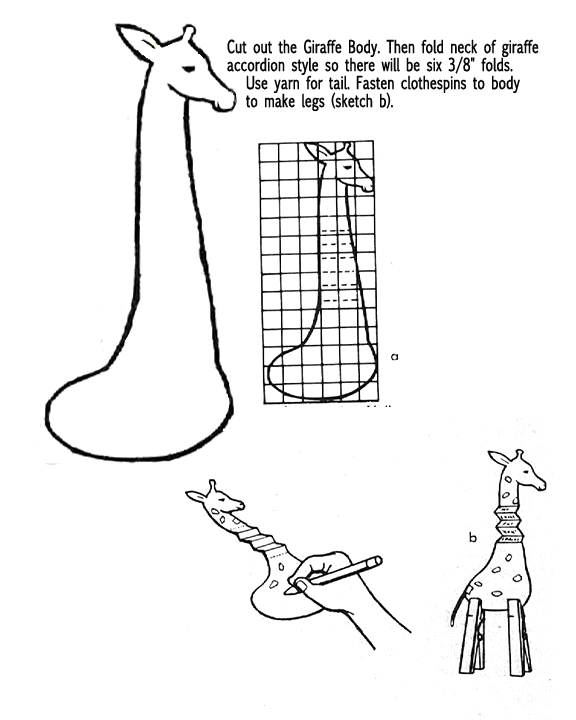 Long Necked Giraffes Paper Easy Making Directions - Learn how to make a giraffe craft with a very long neck. Paper Bag Giraffe Craft for Children - This is a cool paper bag giraffe craft to make! Spotted Giraffe from Soda Bottle Craft - Learn how to make a giraffe from a clear plastic soda bottle, bottle caps, tissue paper and a few other craft supplies.